Grace Jones just can't go to school without her father's old Navy uniform. Dressed in his middy, Grace might look like a tomboy, but her outward appearance simply reflects her inner conviction that she is really Trueblue Tom, ship's captain and trusted companion of Swallows and Amazons characters John and Nancy. As she begins her first year of junior high school, Grace does her best to avoid most stereotypically girly experiences, worrying what John and Nancy might say, while also working toward becoming a member of the Girls' Leader Corps, headed up by the fascinating Chatty Peak. I have enjoyed several of Jane Langton's books (e.g., The Diamond in the Window, The Fledgling, and The Fragile Flag), but had not heard of this one until stumbling upon it at a used book sale. It's actually a sequel to Her Majesty, Grace Jones, which apparently establishes Grace as the kind of child whose imagination frequently runs away with her, and who internalizes the traits of people who inspire her to the point that she begins to behave as they do. Though I have not read the first book, I had no problem jumping right into this one. There are a few references to Grace's past phase where she felt she was royalty, but these are relevant to this story and not at all confusing. 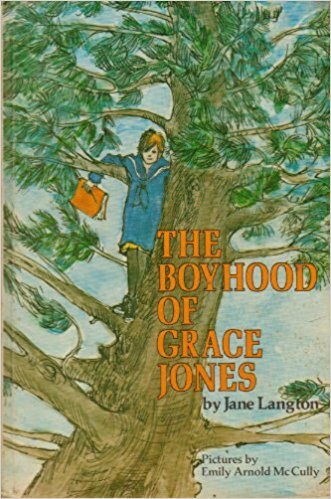 I do think, though, that it is important to be aware of Grace's penchant for make-believe so that the reader does not begin to think of this as a book about gender. Surely, with the current societal focus on the supposedly myriad gender identities people can have, a contemporary reader might wish to make this book fit that agenda, but it doesn't really. Grace may feel like Trueblue Tom, but there is nothing in the book to suggest she wants to become a boy, or that she should want such a thing. Grace is a girl, and, strangely enough, her imaginings about a life at sea are part of her journey toward femininity, not away from it. This is very much a story about a young adolescent learning how to be herself, not by morphing into an alter ego, but by trying on different points of view until she can understand and become comfortable with her own. It is not, as a Goodreads review suggests, a "queerish" book, and parents with reservations about that sort of content need not be concerned. In fact, I would recommend seeking out this book. It is funny in a clever, subtle way, and Grace's flaws and foibles make it easy for today's middle schoolers to relate to her, even though Grace lives during the Great Depression. Though many of the topics explored by this book are typical fare for a middle school story, the author's characterizations and use of descriptive language give it more substance, more emotion, and more depth. As a fan of the Swallows and Amazons series, I was also thrilled by the many allusions to those books which whet kids' appetites for reading them but avoid spoiling anything specific about the series. Also wonderful is the way Grace becomes enamored of the poetry of Samuel Taylor Coleridge. Two of his poems, "Kubla Khan" and "The Rime of the Ancient Mariner," are so significant to Grace's junior high experiences that the author actually includes them in their entirety in an appendix to the book. The author also includes some subtle commentary on the way poetry is taught in school. Grace is so bowled over by "Kubla Khan" that she goes home and memorizes the whole thing in a single night, clearly appreciating the poem for its beauty and depth, all without any adult involvement. When discussing the poem at school, however, Grace's teacher takes all the magic from Coleridge's writing, asking questions such as "Do you happen to know the circumference of Kubla Khan's real estate development?" and "Of what vegetable species is honeydew a member? Does it contain seeds or pits? Where is it grown? Of what country is it the principal commercial product?" I laughed out loud during this scene, as it is a great commentary on the way some teachers take all the enjoyment out of poetry by over-analyzing it. With its drab cover (not Emily Arnold McCully's best) The Boyhood of Grace Jones could be easily overlooked, but it's really worth a second glance. Langton is such a unique author, and Grace is one of the most memorable middle grade heroines I have encountered. I would absolutely recommend introducing her to readers ages 9 to 14. Funny, I loved Jane Langton's fantasy books (especially The Diamond in the Window), but I never read these... Thanks for the review!